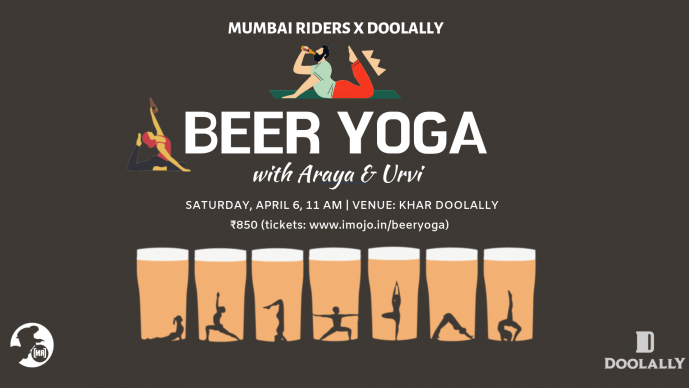 Beer Yoga | First time in Mumbai! There's nothing like putting down an icy cold beer. Except, of course, achieving a higher state of being and eventual transcendence of the 'self' through the practice of yoga. But what if you could do both, at the same time? BeerYoga is the marriage of two great loves – beer and yoga. Both are centuries-old therapies for body, mind and soul. The joy of drinking beer and the mindfulness of yoga complement each other and make for an energizing experience. We take the philosophies of yoga and pair it with the pleasure of beer-drinking to reach your highest level of consciousness! This BeerYoga event will begin with a 60-minute all-levels, yoga class (while sipping your first pint of course!) at Doolally Taproom (Khar West), taught by Certified Yoga Instructors, Araya Sharma and Urvi Gala. After class, yogis are invited to stay and enjoy a post-class pint and lunch. Your registration includes yoga + your first pint of beer. Where: Doolally Taproom, Khar. The venue is also equipped with board-games; the perfect post-yoga activities to chill and socialise. Cost: ₹850 for 1 hour of Beer Yoga, which includes the expertise fee, the beer and free Yoga Mat for the session. Please note you must be 21 or older to attend this workshop and ID is required at the event. Also, this is merely a fun social activity where you relax your body with physical exercises while sipping beer. Call 9619949909 or email us at info@mumbairiders.in for inquiries. Share "Beer Yoga | First time in Mumbai!"